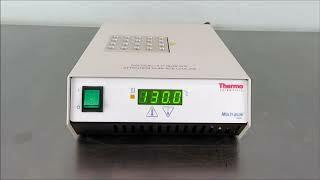 The Thermo Digital Modular Block Dry Bath Incubator provides a modular system for uniform dry heating of samples. This dry heat block is digitally controlled for precise, repeatable results. This sturdily constructed dry bath has a powder coated steel body, and uses a microprocessor control to accurately display temperatures with a built-in temperature sensing probe for internal monitoring. The aluminum block has uniform conductivity, metal sheathed heating elements, and a thermometer well for external monitoring. The Dry Block Incubator has a temperature range of between 5 above ambient to 130°C with a Resolution: ±0.5°C @ 37°C and a uniformity of ±0.4° at 37°C. This Thermo Digital Modular Block Dry Bath Incubator has been fully inspected for functionality and is performing without issue. All of our lab equipment comes backed with our standard warranty. Should you have any questions, please don't hesitate to contact us.